When you need professional help in re-designing or improving the style of your garden, get in touch with Allan's garden design experts in Romford RM1 today. We’re on hand to offer free advice and price estimates on any small or large garden design job you need helping with. Imagine the difference of having a newly laid patio or a freshly made, colourful border which will make your property more attractive? Our rates are extremely competitive, and because we provide a bespoke service based on your personal preferences, you'll receive exactly what you’ve asked for. Whether you're just too busy to do the job yourself or simply need professional advice to help you with the design, Allan's specialists have the skills and expertise to help you every step of the way using the best equipment on the market. 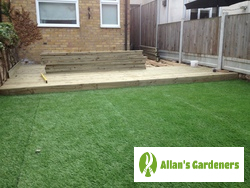 Allan's Romford RM1 garden landscapers will arrive on the day of your appointment on time, equipped with all of the tools needed to get the job done and eager to begin work. They’ll take into account your thoughts and will create a plan that uses every inch of space to its best advantage. Whether you want something low maintenance, a specific theme, a garden to delight the senses, or a safe area for your children to enjoy, they’ll have the ideas and designs to make it work. Looking for some assistance outside of the local area? No problem! 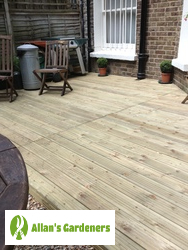 We also offer our quality garden design services in: Greenwich, Lewisham, Camberwell, Battersea, Wandsworth.